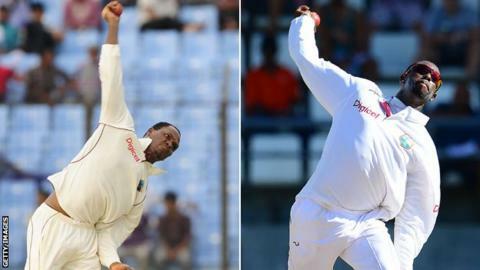 West Indies pair Marlon Samuels and Shane Shillingford have been reported to the International Cricket Council for suspected illegal bowling actions. The off-spinners were reported after the second day of the second Test in Mumbai, which India won by an innings. They can continue bowling but must undergo independent analysis within 21 days. Both have previously been suspended from bowling in international cricket for illegal actions. However, they were allowed to resume bowling after undergoing remedial work and further testing. Batting all-rounder Samuels, 32, was banned from bowling in February 2008 because his arm extended more than the permitted 15 degrees for off-breaks and quicker deliveries. Although the Jamaican continued to play as a batsman, he did not resume bowling in international cricket until September 2011, having served an unrelated two-year suspension from cricket between May 2008 and May 2010 for passing information to a bookmaker. Shillingford, 30, from Dominica, was reported after his international debut in November 2010 and banned a month later when his average elbow extension was found to be 17 degrees. He was cleared to return in June 2011. The pair were reported in Mumbai by English on-field umpires Richard Kettleborough and Nigel Llong, TV umpire Vineet Kulkarni and match referee Andy Pycroft. Their report, handed to the West Indies team manager, refer specifically to Samuels's quicker deliveries and Shillingford's doosras.